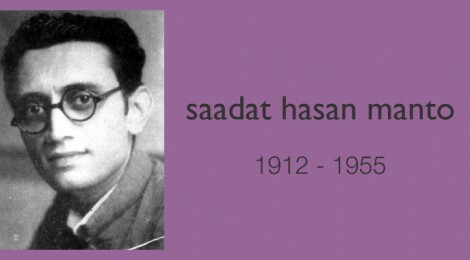 Like every year, the world celebrated Saadat Hasan Manto’s birthday on the 11 th of May. Amidst celebrations world over with readings from his stories, it seems that the world has re-awakened to the presence of one of the most powerful writers in the sub continent. Needless to say, Manto remains one of the most remarkable writers who left a powerful body of work that saw him make use of wit and more importantly his sarcasm to criticize both India and Pakistan, wherever and whenever needed. Having said that, one cannot but wonder whether the resurgence of interest in Manto’s writings in recent times is a result of the times we have been living in, forcing us to step back and take a look at what this intuitive writer had already told us long back. On the 6th of January, this year PTI reported the Border Security Force (BSF) quoting that there was ‘no communication’ between the two sides. The statement came as a reference to Pakistan opening fire at five Border Security Force posts in Jammu’s Hiranagar sector. The statement, though used in reference to the firing has more implications than perhaps meant by the security personnel. News reports from various agencies reported that at least ten Indian and Pakistani soldiers and civilians had been killed in fighting earlier this month and thousands of residents of border villages in Samba and Kathua districts were lodged in makeshift camps away from their homes following indiscriminate shelling of civilian habitations. ‘I came to a familiar Chowk, but the statue I had known was missing. I asked a man where it had gone. “On its own?” I asked. In his essay, By the Grace of Allah, Manto envisages a society where all forms of creativity including music, art, literature and even the poetry would be banned and censored just as it had been done in the times of Pakistan’s national poet Allama Iqbal. One cannot but ask how much has changed since those times? In his essays like Iqbal day, Manto speaks of the censorship that was endured by writers like himself and Iqbal. Iqbal’s poem called Shikwa, which was a complaint against God, was condemned, as had been many of Manto’s writings even though he was recognized as one of the greatest writers from Pakistan. It reminds one of the present day scenario, where censorship has wrought havoc with as many pieces of literature. We live in an age where books, that chose to express views that may not find agreement with mainstream religion are banned, writers/cartoonists are killed because they have lost their rights to laugh at religion. More and more of Manto’s writings have been revived in translation in recent times, perhaps because world over people have freshly found the relevance of his writings in times such as these and as such it makes more sense than ever to read him now all over again. Interestingly Manto is perhaps the only writer who can claim to belong as much to Pakistan as he does to India, in similar yet different ways. His darkest and most popular stories belong to the post partition days when he had to flee to Lahore, mostly fearing for his family’s security. But in his heart of hearts Manto loved India and some of his most delightful writing belongs to the phase when he was in Mumbai( Bombay). Reiterating this very thought process ‘Mint’ columnist Aakar Patel, who has translated Manto’s essays from Urdu to English spoke in Bangalore’s Lekhana literary festival, based on the theme of Narratives Of Violence earlier this year. Mr. Patel reiterated Manto’s love for Bombay and his vivid descriptions of the city, while also reminding the audience of the truth behind his predictions for Pakistan. Contrary to his constant declarations of how politics bored him, Manto’s writings on politics are astute and cover a wide range of predictions that he foresaw, not only for a world society, but Pakistan and India in particular. As such, his writings point towards patterns that India and Pakistan forge with religion, as also their relationship with the United States. This is evident in his satirical writing in the, ‘Letter to Uncle Sam’ which were written in the early 1950s, giving his readers an overview of the politics, culture and international relations of the period with its historical backdrop of partition and how it affected both Pakistan and India. To say that Manto was ahead of his times is an understatement, what he had written then holds good even more today. What is important to reflect upon is perhaps, what the people on both sides of the border have imbibed from his writings and it is only in this realization that Manto would remain in our hearts and assume importance in times such as ours.